September 2018. Fundraising Pub Quiz. Sharing digitial skills. Funding success. Cycling with Share. Shanice's story. New Share bag. 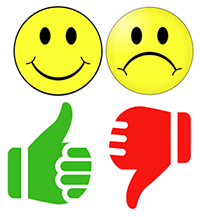 Carers' survey. Opportunities at Share. Share Annual Awards. Healthy recipes from Share. 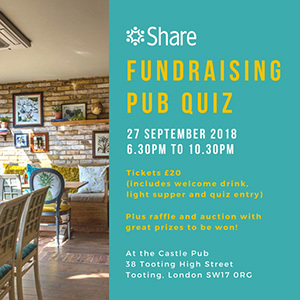 With only a week to go to Share's Fundraising Pub Quiz, which takes place on 27th September 2018 from 6.30pm to 10.30pm at the Castle Pub in Tooting, this is a last call to grab the last few remaining tickets. We've got a fun evening planned for everyone with an amazing raffle and special auction (a real collector's item, especially for all you cricket fans out there!). Tickets are £20 per person and include a welcome drink, light supper and quiz entry. Prizes for our winning team and commiseration gifts for the losing team! Tickets are available to purchase through Eventbrite. Entry is by ticket only and there are only a few tickets left so BOOK NOW! If you'd like to take a full table, it’s best to buy all of the tickets at the same time so we can guarantee a full table. To find out more or to discuss sponsorship opportunities to promote your business or service at the event, contact Caroline Cox via email ceepmr@hotmail.co.uk or telephone 07721 016 015. 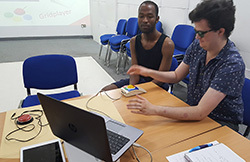 Two Share students – Fynn and Jodian – have each been awarded a City & Guilds Building Communities Award for their work to support disabled people to engage more with digital technology through the Can Do Cyber Citizens Programme run by disability charity, Leonard Cheshire. 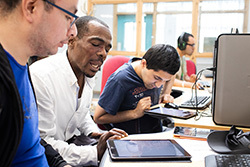 Huge thanks to the Ian Karten Charitable Trust for funding to help us to revamp Share's Digital Skills programme, making it more mobile and accessible for all. 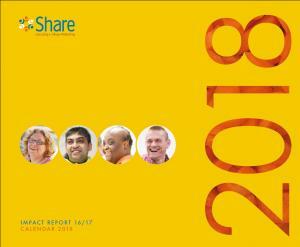 To find out more about Share's Digital Skills programme, contact Share's Digital Inclusion Manager, Gina Morten, via email ginam@sharecommunity.org.uk or telephone 020 7924 2949. 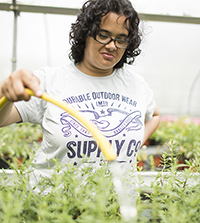 Exercising and learning – that's exactly what Share's Basic Skills students have been doing this summer, thanks to funding from Sports England. 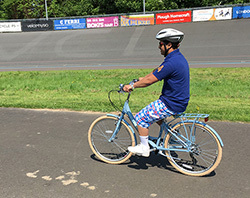 With the help of Wheels for Wellbeing, a charity that promotes inclusive cycling for all, our students have been putting in the laps, and then counting them up and analysing their own data! As always, the latest statistics from our Outcome Star, which measures our students' progress over time, make for interesting reading. 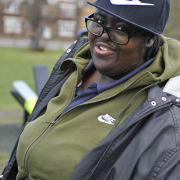 This month, check out Shanice's story and how she's getting fit and healthy with the help of our healthy living programme, working hard in the Share Catering kitchen, and enjoying her time out and about with Share's Go Anywhere, Do Anything programme. Huge thanks to architectural ironmongery firm, SDS London, for once again sponsoring Share's bag. 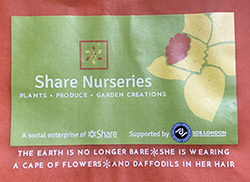 This year, Share's bag promotes our gardening social enterprise, Share Nurseries, which sells plants, produce and garden creations, all grown or made by Share students. It also boasts a beautiful poem created by Share's creative writing students. This month, we are launching our Carers' Survey so you can tell us what we're doing right, what we're not and what we can do better. With more students and more projects than ever before, Share is growing. 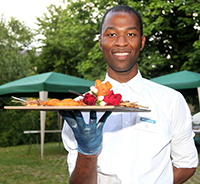 We currently have a number of paid and volunteer vacancies at Share. Join us, make your difference and change the world for disabled people. 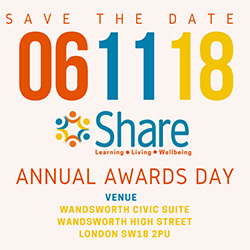 Join us, and our friends and supporters for Share's Annual Awards Ceremony and Lunch on Tuesday 6th November 2018, from 11am to 3pm to celebrate Share's year of 2018. A highlight of our academic calendar, this event is our chance to show off the best of Share!